Help your cakes stand out in the display case with this 9" gold cake circle. This sturdy corrugated cake circle can support heavy cakes while maintaining a trendy style. A laminated gold coloring on the top of this circle ensures your creations stand out for a stunning appearance. The lamination adds an extra layer of protection, preventing grease and oils from seeping into the cardboard and weakening it. This circle also features a scalloped edge which adds another stylish feature to your presentation and highlights your culinary creations. These boards are so convenient for putting together quick dessert cakes and bundt cakes! They are sturdy and fit perfectly into the Wilkinson G27 9" 2-3 Layer Plastic Cake Display Container. Such a time saver! Very sturdy, supports the cake very well. Works great for 7" cake, including room for frosting. Fits well in 10" box. Gold metallic color is very pretty and stands out as a nice feature. Also makes the cakes look good with a finished accent at the bottom. Corrugated structure makes this strong enough to slide in and out of box multiple times, for use cutting slices as needed, when the whole cake isn't eaten at once. Very durable. Ordered these for use at our church bake sale ... they work beautifully with the 9" disposable covers/containers. The gold foil makes them very sturdy and attractive. Very pleased with their durability and the price. These gold cake boards bring a touch of flair to your work. It takes it up a notch. They are sturdy, do not stain, greaseproof, and easy to wipe clean. I am pleased with this purchase. Perfect! exactly what we were looking for for a cake base. looks great under the cakes and baked goods and fits inside of a 10 inch cake or pie box. I bought these in bulk so they will be cheaper per board. I use them to place my 6 or 7 inch cakes on that are already on a greaseproof white cake board and then place it in a 9 inch box. it adds presentation to the finished cake. if the cake is on the heavier side i stick two boards together. These are a great way to keep your cakes looking professional at a minimal cost. They are sturdy and laminated. They are a perfect size for an 8 inch round 2 or 3 layer cake. Works well for our pies and fits perfectly in the 9" pie box. great price and ships fast. Thank you for the great product and price. Just received a case of these today and am pleased to see their shiny gold elegance. These are really going to dress up our cake presentation. Looking forward to using them. We purchased this tray for our wedding reception. We had a cake for each table, and we gave these cake circles to our baker ahead of time. It worked out with our color theme well. Great price, too! Webstaurantstore always offers such a variety of products for my baking business at affordable prices without compromising on quality. These are no exception I use them everyday for my baking business. I got this board for my 8 in cakes which was not the best decision on my part because it leaves little room to decorate. The boards work well for 7 in cakes. They are sturdy to a point, beware if you are using these for a heavy or tall cake as i've had a few dent in then I was holding the cake. My only other complaint would be the unfinished sides and bottom. Make sure your fingers are grease free before picking up the board as you might find finger print later on. I use these laminated gold circles with the cake display container that has a clear dome lid. I simply slide my cheesecakes onto the circle and then place it in the display container. Very reasonable, sturdy construction, and make my cakes pretty. Very happy with the quality, and 25 count is good amount for my small baking business. Thanks! 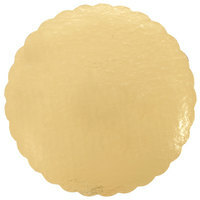 I love these gold cake circles because they give cakes a great finish. I use them for my seven inch cakes especially when I use extra frosting. These are great cake circles. The gold coloring, the easy to wipe off surface, and the scalloped edges make it special. An 8 inch cake would fit perfectly on here, and leave extra room for a border. I like this gold cake board. Helps inhance cakes that I have made. Definitely a deal good deal on webstaurant. I've had good experiences with all the cake circles from webstaurant.. I use the 9" circles to display 8" treats. They are strong and durable. Customers are delighted to see their orders on these elegant laminated gold circles. I really like these for adding a fancy feel to my cakes, and they hold up really well for my cakes with a lot of layers. awesome product great for cake don't bend like the papers plate I was using non grease is the way to go, give your cake the professional touch. This gold cake circle is functional and pretty. The laminated and corrugated features create a sturdy, simple product, ready for any kind of cake. Highly recommended! Excellent! I have been looking for a cake circle of this quality. Why I contemplated ordering for the Webstaurantstore, I have no clue. Glad I did! These cake circle look so wonderful, I almost did not want to use them just to maintain their appearance. Again, "Excellent!" I love that these are so easy to clean up to make sure you are displaying your cake in the best looking way possible. Good price too! Perfect, just what I was looking for. I thought it was to small at first but it fits my 9 inch cake perfectly. I can deliver in style now. I use these for my 8 inch cakes. They leave a nice little lip on the sides in case you want to add a border around your cake. This is an excellent product, the gold is a nice color. Very high quality and very sturdy. Grease does not show up on these which is very important to me. I like these cake circles and the price is great. These work best for presenting the cake on, I prefer the white corrugated circles to use as a cake base for decorating. Work great the board was realy sturdy and the gold laminate to it was really awesome and easy to clean the edge after putiing your cake !!! 5 star!!! The 9" cake circles showcase my product so nicely! The corrugated edge gives it a pretty detail. The gold is a nice balance with the different cake flavors/icings. These are the best cake circles. I\'ve tried others but these absurd grease from the cakes the best. You can easy clean the excess icing. I enjoy using these very elegant laminated cake circles. They look fantastic when combined with the the large containers that I use when I deliver my cheesecakes. Super easy to use. They are very sturdy and work best for 8" or smaller cakes. I placed an 8" cake on it and after cleaning icing it looks as if you have about 1/2" clearance. I really like the gold because I feel it adds a little flair. These cake boards are good for 8" and smaller cakes but my 9" rounds barely fit. I made the mistake of assuming it was made for 9" rounds instead of being exactly 9 inches but you could still make it work. Overall a great product for small round cakes. I have purchased the 9" cake circles numerous times. They are a good quality and are very sturdy for my 3lb. cakes. I highly recommend them. I love using these circles for all my cakes. They are sturdy and the scalloped gold edge gives a nice finished look to all my orders. Very pleased. This product is quite sturdy. Better quality than I expected. If you need a great platform for your cake, you've come to the right place! Exlcellent product. I use the cake circles for 2 lb. cookie trays and the size is perfect. I have ordered this product multiple times and will continue to order them. They help make the cookie trays look very professional. This is a very useful item when making a lot of cakes. I don't have to transfer a fully made cake into the container I just make the cakes on the pads. Also the pads are very decorative and add beauty to the cakes. I needed one of these so bad I made a 9' cake which covered this circle but thats what I needed! So I was thrilled! Great price you get a total of 25! they were a little small in size. if you are making a 9" cake order a larger size. These fit more for 8" or smaller cakes. Thanks for reviewing this item! The cake circle is the correct size; it is 9 inches in diameter. You are correct, this is better for an 8 inch diameter cake. A 9 inch diameter cake will cover the entire 9 inch cake circle, preventing any of the gold edge to show. In order to have the edge of the cake circle to show when there is a cake on top of it, buy cake circles that are at least 1 inch in diameter larger than the cake. These 9" gold laminated cake circles are excellent. I will be continueing to buy them. Look good under a baked cheese cake. Would recommend them to anyone. These cake circles are perfect as a base for cakes. They are sturdy and professional looking. A 9-inch cake fits well, though the flowery edge might not be visible if the layer of frosting is thick. These are very nice cake circles. I use them to put my cheesecakes on before put them in the clear plastic cake container. My customers have said what a nice touch they add to presentation. Do whish they had a little sticky material on the bottom, as they slide inside the container. I have to use tape. Love these. Just the right size. They leave about a 1/2 inch around so you see the scalloped edges to add that extra little touch of class to all your 9" cakes. Will be reordering soon. Love these cake circles. They are strong enough to hold a two layer cake and look beautiful when served. They hold up nicely when the cake is cut. Absolutely love these they bring a wonderful look to my cakes and treats. The gold color gives off a elegant design. I'm very satisfied with this purchase. The cake circles are nice. They add a professional look to my finished cakes along with 2 piece cake domes.It is very affordable and sturdy product. beautiful gold color and nice scalloped edge. Very durable when placing cakes on them, too. easy to decorate on and when done you have a wonderful looking product. I use thes in all round cake baking!